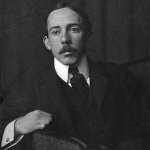 Alberto Santos-Dumont was born in 1873 in the town of Palmira (now Santos Dumont). His father was an engineer, but shortly after Alberto's birth he became the manager of a coffee plantation. From an early age Santos-Dumont was fascinated by machinery. In 1891, Santos-Dumont moved to Paris with his parents. There he continued his education and became interested in balloons and dirigibles. He made numerous flights on lighter-than-air aircraft, some of which he constructed himself. In the early 20th century, his primary interest turned to heavier-than-air aircraft. Santos-Dumont's first successful flight of a heavier-than-air aircraft took place on October 23, 1906. It was the first flight of a powered heavier-than-air machine in Europe to be verified by the Aéro-Club de France (then simply the Aéro-Club). Although Santos-Dumont spent most of his life in France, Brazilians consider him to be a national hero. The anniversary of his historical flight was designated as Aviator's Day.